Towards the end of February, I and a few other drama minors from my school were lucky enough to attend the Kennedy Center American College Theatre Festival (otherwise known as KCACTF). While at the festival, I learned a lot about the theatre world, about myself, and about what I want to do with my future. Here are just a few of the things I continually pondered over the course of the week. 1. Obedient actors are not fun actors. During a workshop on directing, we were told that actors who go with whatever the director says are not fun. The leader of the workshop said that collaboration is important, and if the actors of willing to follow blindly, there won’t be any. In order for the production process to be fun and inventive, everyone has to have something to say and be willing to say it. Of course, the director is the director for a reason and should have the final say in what is implemented, but collaboration is what makes theatre good. Everyone has good ideas, and no one should be afraid to share them. 2. The actor’s voice is a powerful thing. I also took a workshop on voice and articulation. The leader of the workshop kept driving in the point that the actor’s voice is extremely powerful. It has the capacity to make an audience feel things, and that isn’t a responsibility to be taken lightly. I noticed this a lot in the play I was in back in March, and I’m noticing it even more in A Wrinkle in Time. As an actor, how you use your voice changes how the story is perceived, though this is definitely not just true for actors. As people, how we use our voice has the power to affect the people around us. Towards the middle of the week, I went to a panel on making art under negative political climate. One of the members of the panel said the quote above, and said that this is what she told her students the night of the 2016 Presidential Election. Hearing her say this almost made me cry, and not just because it embodies everything I think theatre should be. No one should be able to mess with your safe space, not even someone in a position of high power. Use your space for good, both for yourself and for other people. 4. My career goals are not necessarily unheard of, but they are also unique. One of the last things I attended was a class on starting a theatre company. I wasn’t expecting many people to be there, but there was a fairly large group of people, all of whom wanted to do something similar to what I want to do- start a theatre company and use it to positively affect the surrounding community. Being around all those people made me realize that I am going to encounter competition in literally every area of this world, and that’s not exactly comforting. Going to this class was almost encouraging, however, in that I realized I still have a niche. I want my future company to have a strong emphasis on theatre, music, and dance education, as well as elements of Expressive Arts therapy. I may be up against many others who want to start theatre companies and use them for good, but I still have unique ideas. 1. Quick changes are terrifying. Before Calendar Girls, I had never had to do a quick change for myself, nevertheless for someone else. Let me tell you, I have never hated buttons more than I did during the last four weeks. Still, I learned how to stay calm under pressure. I learned how to communicate efficiently without using words. Above all, I learned how to do a quick change without panicking. 2. Theatre people make my heart happy. Throughout the show, I had multiple conversations with the other dressers. Some were silly, but some were deep and genuinely made me think. Everyone I talked to was lovely, and I didn’t have a single day where I left feeling awful. I know this isn’t what happens with every show, but in general theatre people just make me very happy. In every theatre and drama department I have worked with, I have found kind people who make me a better person. 3. There’s no age limit for creativity. The cast of Calendar Girls was made up of people from various age groups. The actress I worked with directly was probably my grandmother’s age, and she’s been acting for forever. Everyone in the cast was insanely talented, and I feel very lucky to have been able to spend time with them all. In working with them, I was reminded that creativity has no age limit. You can be funny, talented, and creative at any age, and if this show was any indicator, you only get better with age. 4. Theatre is my church. This is something I’m going to talk more about later, but while working with the Little Theatre, I discovered that the uplifting, courageous, and often meditative atmosphere is everything I’ve been looking for in a church but haven’t been able to find. I have always wanted church to be a place where people feel acknowledged and accepted, and for it to be a safe place where anyone can express themselves. While working with Calendar Girls, I realized that that is what theatre is. During breaks between quick changes, I often found myself praying. It started off as contemplating my day and what I would go back to after leaving the theatre, and it evolved into praying for wisdom. Theatre is my safe place, and over the last few weeks it has become my church. I absolutely loved my time with the Little Theatre and with Calendar Girls. I learned more in the four weeks than I thought I would, and most of what I learned cannot be put into words. I am so incredibly thankful for the opportunity I had, and I hope this wasn’t my last time working with this theatre and with these people. To my fellow dressers, thank you for all the memories- you are already dearly missed. About a month ago, I finished a six week internship with a nearby theatre. I was the intern for their production of The Music Man, and the opportunity offered experience and education that I so greatly needed before heading off to college. I feel very lucky that this experience fell into my lap, and I learned a lot during my time behind the scenes. At the beginning of my time with Stage Right Productions, I had a day where I tried to 1. Block a dance scene, 2. organize costumes, and 3. run music for one of the songs all at the same time. This wasn't the norm, which was good, but I learned quickly that you can't do everything. I could do all those things, yes, but not at the same time. In order for me to give each part of my work all the attention it deserves, I had to learn how to keep track of all the things I was asked to do, and do everything to the best of my ability as quickly as I could. 2. Tough skin, soft heart. I actually heard this in an interview with a Tony Award Nominee around the time I started the internship. In any job, any industry, any situation, you will encounter people asking you to do something differently. Sometimes this is constructive, other times this is plain criticism. I didn't experience anything like this during the internship, but the interview I watched was on my mind the whole time. I kept thinking that if I want to continue on this path towards the career that I want, I will have to grow some thicker skin. Even so, I can't let that toughness make it's way to my heart. Be tough. Take every piece of criticism to see if you can make something constructive out of it. But after that, be sure to stay kind. Being criticized can make you pessimistic. Don't let it make you into a bad person. 3. Say you can, and then learn how along the way. One of the first things I was asked to do was block a scene for one of the dances. I had never done that before, but figured out how very quickly. There were many other things I didn't know how to do before I was asked to do them, and they weren't easy things to learn, either. But I figured it out, and while I wasn't the absolute best at everything, I still did them. Because that's what you do when you're learning. Now, I feel far more prepared for any job in a theatre I get in the future, and that's all thanks to me being asked to do things I didn't know how to do. 4. "The moment you think you're good enough, you're done." I overheard someone say this, and I had to write it down because it's so true. You may be the most talented actor/singer/dancer in the entire world, past, present, and future. But the second you begin to think that you deserve the parts you want, or that a certain role is beneath you, you're done in the industry. Being humble is so important. If you don't take constructive criticism or allow yourself to learn new things, you'll stay static. You won't develop into what you could become. 5. Every good director brings the humanity to each scene in the show. The director that I worked with is one of the smartest directors I've ever met. One of the things that I think makes her so great is her ability to bring out the empathy, the soul, the humanity in each and every scene. My first day, I was with the director while she talked to one of the people in the cast. They were creating a backstory for the character, something that would bring more purpose to what was happening. I've been creating backstories for the characters I've played for years, but I didn't stop to think that this is the kind of thing that brings more depth to the story you're telling. By bringing out more in a character, you give the actor a reason and purpose for why they're doing what they are doing. Towards the end of the internship, I told my mom that I figured those in the show get more out of it than the audience. Sure, the audience experiences the emotions the actor is portraying and they in turn take something from the performance, but those who are actively involved in the production know the backstories they've created for their characters. They know everything they've been told during rehearsals. They know the symbolism of their actions, and they know every hidden joke. I am so incredibly thankful for my time with Stage Right Productions. I ended up there in such a random way, and I'm so glad that I did. I'm starting school in less than a month, and that means I'll be around other drama minors, many of whom may be trying to get to the same place I am. I feel far more prepared than I did when I graduated. I know that I can do more than I could before. I know that I can handle being thrown into things without really knowing what I'm dong. I know that I'm capable of working towards this career. Again, I am so thankful for my time with Stage Right Productions. I can't think of a better way I could have spent the beginning of my summer. 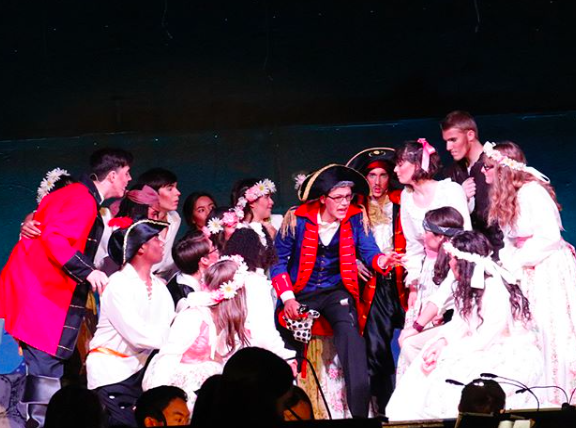 In all honesty, I wasn't the biggest fan of Pirates of Penzance until around February. And then I didn't truly love it until after the first performance at the end of March. But now that it's all over, I miss it quite a lot. As with Les Mis, I learned a lot this during this musical, and I thought I'd put them below for all of you to see. 1. I am most definitely not a natural soprano. I don't know what happened, but somehow when I switched schools I ended up in the soprano section of the choir. I spent the first semester of my Junior year feeling like I'd wandered into some mythical land that I'd only ever dreamed of, and then my second semester realizing that being a soprano is not what I was cut out for. I got used to it, until the beginning of this year when I was made a first soprano. When we had our choral festival, I started to seriously doubt my soprano abilities, and that feeling was only heightened during the rehearsals for this musical. I am not a natural soprano- in fact, I'm not sure I'm a soprano at all. I definitely miss being an alto, although getting the chance to see what being a soprano is like wasn't all that bad. 2. It isn't Gilbert & Sullivan's fault, but I just don't like Pirates of Penzance. At least, I didn't like it at first. It's one of those musicals that can take you a while to get into, but once the first dress rehearsal came around, I found myself becoming rather defensive of it towards other cast members who were still less than thrilled. Sure, it's definitely a different music style than I'm used to, even in the genre of musicals, but once you start getting into it it's actually really fun. Parts of it are really funny, too, and when you're part of it, it's not hard to lose yourself to the character, which is one of my favorite feelings. 3. Having a positive attitude can truly make a huge difference. It's a lot harder to do a musical you already don't like that much when you also have a negative attitude about it. I'll be honest, there are things I would have changed about this year's musical. But focusing on all that I would change didn't make those things better, it only made it harder for me to enjoy the parts I actually really liked. When I starting trying to have a positive attitude, I found that while the parts of me that wanted to change things didn't totally go away, I was still enjoying the whole experience a lot more. 4. It isn't often that you get a group of people who get along really well and all love what they're doing. I think the biggest thing I learned is that Les Mis last year isn't the normal. It isn't necessarily an anomaly either, but it isn't what I'll always get. I won't always get a group of actors who love the show with all their hearts and also love each other. However, I also learned that even when everything isn't picture perfect, there are still wonderful parts of it. For instance, the other General's daughters and I got along really well, and I couldn't think of a better bunch to play my stage sisters. There are often groups within groups, and when you find the one that fits you the most, it can make everything else a lot better. 5. I'm not great at having eye liner applied to my eyes by someone else. I guess I actually learned this last year on music tour when one of my friends tried to put eyeliner on me and I ended up seeing Into the Woods with one eye lined and the other with only mascara. Still, this knowledge was only reinforced during the first dress rehearsal when one of the girls put it on and another held my head in place. I did eventually learn that if I find a spot on the ceiling and stare at it with intensity I'm okay, but I didn't figure that out until the third (out of four) performance. 6. Being on stage is actually really meditative for me. It's kind of hard to explain I guess, but being on stage is really calming. When I'm rehearsing or performing, I forget about everything else and focus on this one thing I need to be doing. Throughout the last four months, lots of stressful events have occurred. I've had bad days and weeks, and I've gotten frustrated with school more times than I can count. But when I'd go to a rehearsal, I'd feel all that frustration and anxiety slip away and I'd feel so much better afterward. The same goes for the performances, in fact that feeling was heightened during the four performances we had. 7. Despite what was difficult about this year, I wouldn't have chosen any other way to spend January-April. This is still what I want to do. This is still the thing that makes me the happiest. There is no other way that I can imagine myself doing if given the opportunity. Yes, there was a moment in February where I seriously considered dropping out. I wasn't enjoying myself, and I didn't see the point anymore. But I knew that when the time came and I doing my mandatory part with the choir, I would regret not being on stage as part of the cast. And even during my uncertainty of whether or not I still wanted to do this, I never doubted the fact that this is what I want for life. There is no other career that brings this much joy from my spirit. There is no other future that I want. This is truly what I believe I was made to do. I've figured that out, and now it's just a matter of getting there. 1. Being part of the supporting cast is so much fun. I really wish I could go back and tell myself back in December that I didn't need to worry so much, because I honestly believe that I would not have had as much fun as I did had I gotten one of the parts I auditioned for. Of course this isn't going to stop me from auditioning for big roles in the future, but I'm happy I got to be a factory worker, a beggar, a dancer, someone with a candle, and many other things. Girl 2, you will be missed. 2. It is technically possible to go to a two and a half hour practice after pulling an all-nighter because you came back from Nebraska, but it is not recommended. Seriously. Don't do it. I would not recommend it. 3. Taking yourself too seriously is no fun. Had I tried to take myself seriously the whole time and beat myself up for making small mistakes (that no one really noticed), I would have been bored and stuck up the whole time. And that, my friends, is no fun at all. Especially if you're like me and you get quiet and angry and sad without any real warning when you're hungry. 5. I look like Little Bo Peep in poofy tule dresses. Also, it's hard to waltz whilst looking like Little Bo Peep. 6. I have never laughed as hard as I did while dancing backstage and then onstage. Again, taking yourself too seriously is no fun. 7. I might be allergic to whatever was in the fake dirt/mud I had to wear. Halfway through Act 1 of the first performance, my face started to sting and the fake mud was wiped off as much as possible in the dark. During the second performance, I completely forgot about it and the same thing happened again. 8. It's "a platoon of snappers" not "a platoon of badgers"
Actually, it's "a platoon of sappers" ... I learned this on the final night. 9. This is what I want to do for the rest of my life.